Iowa researchers have a new ally in the battle against cancer: our pets. Iowa State University veterinary oncologist Chad Johannes (right) will team up with UI physicians in the Side by Side in Cancer Research program. 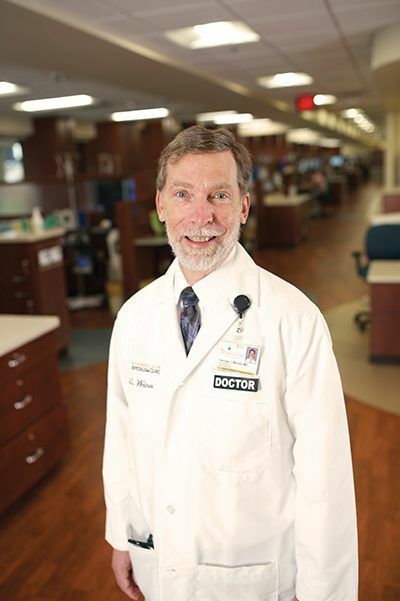 As director of the UI’s Holden Comprehensive Cancer Center, George Weiner studies CAT scans. As coordinator for the veterinary oncology program at Iowa State University, Chad Johannes scans cats. Together, they hope to make strides in the fight against cancer, for two-legged and four-legged patients alike. 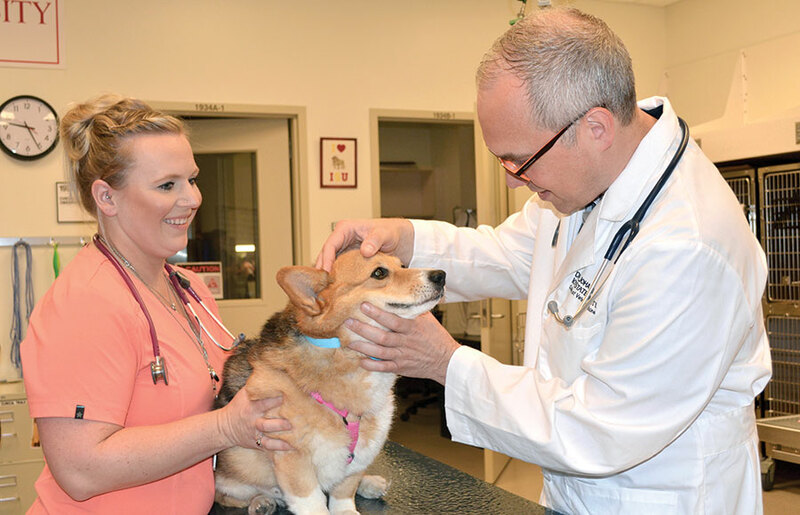 In a new partnership between the state’s premier medical and veterinary colleges, scientists are examining how cancer research in pets can benefit humans—and vice versa. The program, called Side by Side in Cancer Research, has sparked new collaborations between physicians and veterinary researchers whose patients’ cancer cases are surprisingly similar. George Weiner is director of the UI’s Holden Comprehensive Cancer Center. A visit by Weiner earlier this year to ISU sparked the idea for the partnership. While in Ames to speak at a seminar, he met with veterinary oncology faculty and students and, for the first time, toured a major animal hospital. Weiner was struck by the familiarity of it all: A pharmacy with drugs similar to those being used at Holden, an infusion center for patients, and talk of treatment regimens all-too familiar to doctors in Iowa City. Of course, there were also some surprises: “I just saw a llama with pemphigus,” he overheard one faculty member say, referring to a skin disease. At the end of his visit, Weiner met with Johannes, who leads ISU’s companion animal oncology program. While UI and ISU cancer researchers have collaborated on one-off projects in the past, the two doctors discussed possibilities for an ongoing partnership in a number of areas. The Side by Side in Cancer Research program soon took shape, including a new fund established through the UI Center for Advancement to support the initiative. Collaborations are already in the works. Holden has been a leader in promising research that shows high doses of vitamin C can be used to attack cancer cells, so ISU researchers have been working with their UI colleagues in recent months to study its effectiveness in veterinary patients. A paper detailing their findings is forthcoming. The two institutions also plan to study the impact of radon, a gas carcinogen, on domesticated animals. While radon is the second-leading cause of lung cancer in humans, less is known about how it affects cats and dogs living in homes with high radon levels. According to the American Veterinary Medical Association, about half of dogs over age 10 develop cancer, and they’re stricken with the disease at about the same rate as humans. Dogs—particularly larger breeds like golden retrievers and Bernese mountain dogs—often suffer from the same types of cancers as humans. These include lymphoma, osteosarcoma, melanoma, and colorectal cancer, which Weiner and Johannes say present an opportunity for comparative studies. 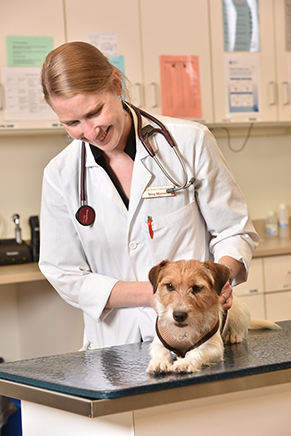 Iowa State assistant professor Margaret Musser is among the members of the university’s veterinary oncology team. Side by Side leaders are in the process of raising pilot funds to launch a new peer review competition in which UI and ISU researchers would pitch collaborative projects, then vote to fund the most promising ideas. They’re also planning visits to and from Ames and Iowa City, as well as a research symposium to exchange ideas. Learn more about Side by Side in Cancer Research and how you can support the program with a donation.